ORCID number: Thomas F Heston (0000-0002-5655-2512); Jackson M King (0000-0003-0527-6172). Author contributions: Heston TF and King JM made substantial contributions to this article, drafted the manuscript and approved the final version of the article. A statistically significant research finding should not be defined as a P-value of 0.05 or less, because this definition does not take into account study power. Statistical significance was originally defined by Fisher RA as a P-value of 0.05 or less. According to Fisher, any finding that is likely to occur by random variation no more than 1 in 20 times is considered significant. Neyman J and Pearson ES subsequently argued that Fisher’s definition was incomplete. They proposed that statistical significance could only be determined by analyzing the chance of incorrectly considering a study finding was significant (a Type I error) or incorrectly considering a study finding was insignificant (a Type II error). Their definition of statistical significance is also incomplete because the error rates are considered separately, not together. A better definition of statistical significance is the positive predictive value of a P-value, which is equal to the power divided by the sum of power and the P-value. This definition is more complete and relevant than Fisher’s or Neyman-Peason’s definitions, because it takes into account both concepts of statistical significance. Using this definition, a statistically significant finding requires a P-value of 0.05 or less when the power is at least 95%, and a P-value of 0.032 or less when the power is 60%. To achieve statistical significance, P-values must be adjusted downward as the study power decreases. Core tip: Statistical significance is currently defined as a P-value of 0.05 or less, however, this definition is inadequate because of the effect of study power. A better definition of statistical significance is based upon the P-value’s positive predictive value. To achieve statistical significance using this definition, the power divided by the sum of power plus the P-value must be 95% or greater. Scientific research has long utilized and accepted that a research finding is statistically significant if the likelihood of observing the statistical significance equates to P < 0.05. In other words, the result could be attributed to luck less than 1 in 20 times. If we are testing for example, effects of drug A on effect B, we could stratify groups into those receiving therapy vs those taking placebo vs no pharmacological intervention. If the data resulted in a P-value less than 0.05, under the generally accepted definition, this would suggest that our results are statistically significant. However, it could be equally argued that had it resulted in a P-value of 0.06, or just above the generally accepted cutoff of 0.05, it is still statistically significant, but to a slightly lesser degree - an index of statistical significance rather than a dichotomous yes or no. In that case, further testing may be indicated to validate the results but perhaps not enough evidence to outright conclude that the null hypothesis, drug A has no effect, is accurate in this sense. The originator of this idea of a statistical threshold was the famous statistician R. A. Fisher who in his book Statistical Methods for Research Workers, first proposed hypothesis testing using an analysis of variance P value. In his words, the importance of statistical significance in biological investigation is to “prevent us being deceived by accidental occurrences” which are “not the causes we wish to study, or are trying to detect, but a combination of the many other circumstances which we can not control”. His argument was that P ≤ 0.05 was a convenient level of standardization to hold researchers to, but that it is not a definitive rule as an arbitrary number. It is ultimately the responsibility of the investigator to evaluate the significance of their obtained data and P-value. For example, in some cases, a P-value of 0.05 may indicate further investigation is warranted while in others that may suffice. There were however, opposing viewpoints to this idea, namely that of Neyman J and Pearson ES who argued for more for a “hypothesis testing” rather than “significance testing” as Fisher had postulated. Neyman and Pearson raised the question that Fisher failed to, namely that with data interpretation there may be not only a type I error, but a type II error (accepting the null hypothesis when it should in fact be rejected). They famously stated “Without hoping to know whether each separate hypothesis is true or false, we may search for rules to govern our behavior with regard to them, in following which we insure that, in the long run of experience, we shall not be too often wrong”. Part of the Neyman-Pearson approach includes researchers assigning prior to an experiment, the alternative hypothesis which should be specific such that drug X has Y effect by 30%. This hypothesis is later accepted or rejected based on the P-value whose threshold was arbitrarily set at 0.05. These two viewpoints between Neyman-Pearson and the more subjective view of Fisher were heavily debated and are ultimately recognized as either the Neyman-Pearson approach or the Fisher approach. In today’s academic setting, the determination of statistical variance with a P-value has truly become dichotomous, either rejection or acceptance based on P < 0.05, rather than more of an index of suspicion as Fisher had originally proposed. However, an approach of confidence based on the P-value could be beneficial rather than a definitive decision based on an arbitrary cutoff. The meaning and use of statistical significance as originally defined by Fisher RA, Jerzy Neyman and Egon Pearson has undergone little change in the almost 100 years since originally proposed. Statistical significance as original proposed by Fisher’s P-value was the determination of whether or not a finding was unusual and worthy of further investigation. The Neyman-Pearson proposal was similar but slightly different. They proposed the concepts of alpha and beta with the alpha level representing the chance of erroneously thinking there is a significant finding (a Type I error) and the beta level representing the chance of erroneously thinking there is no significant finding (a Type II error) in the data observed. Statistical significance as currently used represents the chance that the null hypothesis is not true as defined by the P-value. The classic definition of a statistically significant result is when the P-value is less than or equal to 0.05, meaning that there is at most a one in twenty chance that the test statistic found is due to normal variation of the null hypothesis. So when researchers state that their findings are “statistically significant” what they mean is that if in reality there was no difference between the groups studied, their findings would randomly occur at most only once out of twenty trials. For example, consider an experiment in which there is no true difference between a placebo and an experimental drug. Because of normal random variation, a frequency distribution graph representing the difference between subjects taking a placebo compared with those taking the experimental drug typically forms a bell shaped curve. When there is no true difference between the placebo and the experimental drug, small differences will occur frequently and cluster around zero, the center of the peak of the curve. Relatively large differences will also occur, albeit infrequently, and these results are represented by the upper and lower tails of the graph. 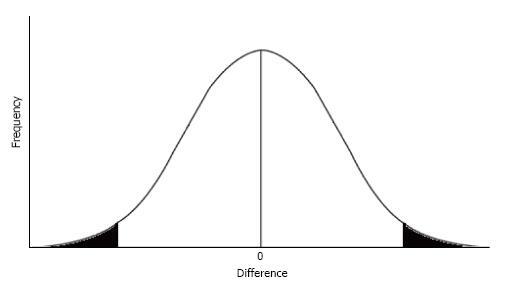 Assuming the entire area under the bell shaped curve equals 1, as represented in Figure 1, the findings are assumed to be statistically significant when the difference found falls in either the lower or upper 2.5% of the frequency distribution. Figure 1 According to the classical definition, research findings are considered statistically significant when the difference observed falls in the upper or lower tails of the frequency distribution, represented above in black. Note that the classical definition of statistical significance according to Fisher relies only upon a single frequency distribution curve, representing the null hypothesis that no true difference exists between the two groups observed. Fisher’s approach makes the primary assumption that only one group exists, as represented by a single frequency distribution curve, and P-values (the likelihood of a large difference being observed) define statistical significance. The Neyman-Pearson approach is slightly different, in that the primary assumption is that two groups exist, and two frequency distributions are necessary. In this approach, the tail of the frequency distribution representing the null hypothesis (no difference) is represented by alpha (α). Similar to the P-value, alpha represents the chance of rejecting the null hypothesis when in fact it is true, a Type I error. The tail of the frequency distribution representing the alternative hypothesis (a true difference exists) is represented by beta (β). Beta represents the chance of rejecting the alternative hypothesis when in fact it is true, a Type II error. If we are doing a one-tailed comparison, e.g., when we assume the experimental drug will improve but not hurt patients, alpha and beta can be visualized in Figure 2. The area in black represents a Type I error and the lined area represents a Type II error. Figure 2 If the observed difference is greater than x, then we consider that the finding is statistically significant and the null hypothesis is rejected. If the difference found is less than x, then we accept the null hypothesis and reject the alternative hypothesis. The area in black represents a Type I error which occurs when the difference is greater than x, but the null hypothesis is in fact true. The lined area represents a Type II error which occurs when the difference found is less than x, but the alternative hypothesis is in fact true. It is time that the statistical significance be defined not just as the chance that the null hypothesis is not true (a low P-value), or the likelihood of error when accepting (α) or rejecting (β) the null hypothesis. While these statistics help us evaluate research data, they do not give us the odds of being right or wrong, which requires that we analyze both the P-value with β together. While it is helpful to visualize the concepts of alpha and beta on frequency distribution graphs, it is additionally illuminating to compare these concepts with sensitivity, specificity, and predictive values obtained from 2 × 2 contingency tables. In Table 1, the rows represent our statistical test results, and the columns represent what is actually true. Row 1 represents the situation when our data analysis results in a P-value of ≤ 0.05, and row 2 represents the situation when our analysis results in a P-value of > 0.05. The columns represent reality. Column 1 represents the situation when the alternative hypothesis is in reality true, and column 2 represents the situation when the null hypothesis in reality is true. Table 1 Statistically significant research findings can represent a true positive or false positive. Similarly, statistically insignificant findings may represent a true or false negative. In Table 1, row 1 column 1 are the true positives because the P-value is ≤ 0.05 and the alternative hypothesis is true. Row 1 column 2 are false positives, because even though the P-value is ≤ 0.05, the reality is that there is no significant difference and the null hypothesis is true. Similarly, row 2 column 1 are the false negatives because the P-value is insignificant (P > 0.05) but in reality the alternative hypothesis is true. Row 2 column 2 are the true negatives because the P-value is insignificant and the null hypothesis is true. Table 2 shows our findings in terms of alpha and beta. In this case, alpha represents the exact P-value, not just whether or not the P-value is ≤ 0.05. Beta is not only the chance of a Type II error (a false negative), it is used to determine the study’s power which is simply equal to 1 - beta. Table 3 shows the same information in another way, showing the situations in which our test of statistical significance, the P-value, is in fact correct or is in error. Table 2 When the P-value is utilized to determine whether or not a finding is statistically significant, 1-beta represents the sensitivity for identifying the alternative hypothesis, and 1-alpha represents the specificity. Table 3 A Type I error corresponds to 1-specificity and a Type II error corresponds to 1-sensitivity when study findings are determined to be significant or insignificant based upon the P-value. When we know beta and alpha, or alternatively the P-value and power of the study, we can fill out the contingency table and answer our real question of how likely is it that our findings represent the truth. Statistical power, equal to 1 - beta, is typically set in advance to help determine sample size. A typical level recommended for power is 0.80. Table 4 is an example 2 × 2 contingency table in the which the study has a power of 0.80 and the analysis finds a statistically significant result of P = 0.05. In this situation, the sensitivity of the test statistic equals the power, or 0.8/(0.8 + 0.2). The specificity of the test statistic is 1 minus alpha, or 0.95/(0.05 + 0.95). Our positive predictive value is power divided by the sum of power and the exact P-value, or 0.80/(0.80 + 0.05). The negative predictive value is the specificity divided by the sum of the specificity and beta, or 0.95/(0.95 + 0.20). Table 4 This 2 × 2 contingency table shows the corresponding values for a research study where a study finding is determined to be significant based upon a P-value of 0.05 and when the study’s power is 80%. Table 5 P-values corrected for study power. Statistical significance has for too long been broadly defined as a P-value of 0.05 or less. Using the P-value alone can be misleading because its calculation does not take into account the effect of study power upon the likelihood that the P-value represents normal variation or a true difference in study populations. If we want to be at least 95% confident that a research study has identified a true difference in study populations, the power must be at least 95%. If the power is lower, the required P-value to indicate a statistically significant result needs to be adjusted downward according to the formula P-value = (power - 0.95*power)/0.95. Furthermore, by using the positive predictive value of the P-value, not just the P-value alone, researchers and readers are able to better understand the level of confidence they can have in the findings and better assess clinical relevance. Only when the power of a study is at least 95% does a P-value of 0.05 or less indicate a statistically significant result.